Editor’s Note: This is another weekly column in the Wanganui Chronicle. 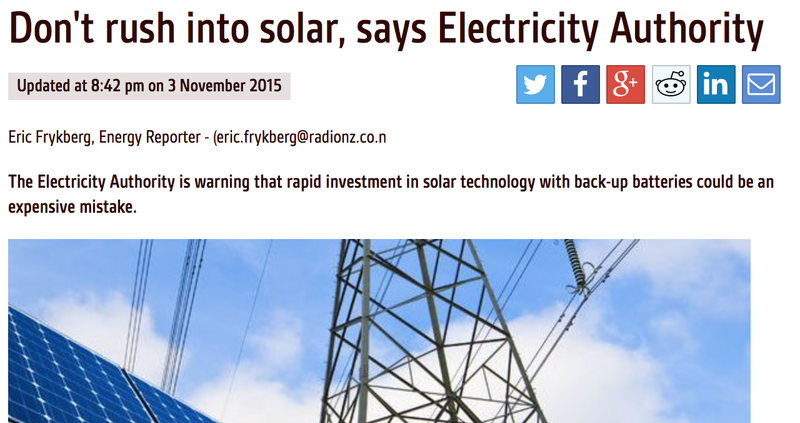 “Don’t rush into solar, says Electricity Authority.” That was the headline on Radio New Zealand News a month ago. Their warning focused on a company called solarcity and their programme called solarZero, “whereby homeowners can get solar panels installed on their roof at no upfront cost – as long as they make a 20-year commitment to pay a fixed monthly fee” that functions as a rental and servicing agreement. The Newman’s ran the numbers and found that for a “normal” household the total payments over 20 years would be $26,400. My colleagues in the eco design field came up with similar numbers, and determined that the equivalent system could be purchased today for half that. In effect, signing a contract for the solarZero programme would be similar to taking out a loan to pay for solar panels and paying it off over 20 years. In both cases, economically savvy and fiscally prudent people would decline, and instead invest in products and strategies with much better financial returns. This was essentially the same conclusion reached by researchers at the University of Canterbury Electric Power Engineering Centre, which I wrote briefly about last week. Those researchers found that grid-tied solar electricity systems were financially viable only for households who could pay cash up front for the panels and who use lots of electricity during daylight hours. In other words, rich people who use heaps of power. That’s fine for them, but not aligned with the theory and practice of eco-thrifty renovation. Over the course of 500 home consultations, I have never recommended installing photovoltaic panels as one of the top twenty (or more) suggestions that are proven to be cost effective for creating warm, dry, healthy, energy-efficient homes. In response to those who protest loudly, and insist PV is cost effective, I have said for years, “Show me the numbers.” No one has come forth, yet the protests remain. Hell hath no fury like an environmentalist scorned. Last week I also shared research showing that household PV panels have a much greater carbon footprint than wind or geothermal power that I’m sure ruffled feathers among those still clinging to dogmatic beliefs. I have found it immensely amusing and ironic that I’ve been black-listed by local greens at the same time as being thanked and praised by Federated Farmers. Makes me wonder which group is more open-minded. Please bear in mind that this column is written by someone who owned an off-grid home powered by PV for eight years, and who presently has a stack of panels ready to mount on the roof. But that’s another story. In the mean time, here are some other suggestions for fun, easy and cost effective ways of using solar energy: Grow a vegetable garden. Make a solar cooker. Air your washing on the line outdoors. Personally, I am immensely grateful for the sun, and the rain, and the soil, for contributing to a record crop of the World’s Best Garlic this year. Like the mighty All Blacks, this year’s crop of Allium sativum has truly outdone itself. Available at the River Market for the next four weeks only. I just can’t see how Solar cannot be considered cost effective? Especially for a grid-tied system. If people are getting credits (even though the payback is pitiful) then in hardly any time they will have paid for the system in electricity bill savings. Yes Solar Panels (& Batteries, if you go that route) have a manufacturing Carbon Footprint. But surely when you take into account the reduction in need for some of the 25% of power that’s fossil fuel based in NZ. Plus the freeing up of money from saving on power bills, so people can spend it on further eco items. Would equate to an overall win for Solar? Also I don’t get the comparison to Geothermal, (not an option for home users) and also wind for most people. I’m guessing you’re referring to mass centrally controlled generation there, which seems at odds to the rest of the blog post. Thanks for your comment. For context you’ll need to read last week’s post. These numbers have run by the experts in the country. I trust them. At the same time, no one has shown me any evidence to the contrary despite me asking for over five years. I feel the sustainability movement falls down when robust research is not honoured. Anecdotes won’t get us far, in my opinion. As for carbon footprint, investment in energy generation is investment in energy generation. For someone who is grid tied and wants to promote lower carbon emissions, the most effective and affordable choice is to choose a power company that uses geothermal or wind power. Dollar for dollar these will make a bigger difference.